Water is an integral part of survival today and it is a must-need for every household, office, commercial spaces, industrial sites, etc. 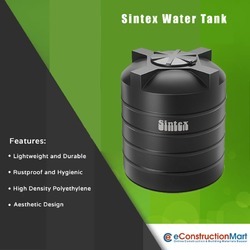 We, at eConstruction Mart, understand this basic need of yours and therefore, in order to ensure round the clock supply of water, we supply Sintex water tank that can be installed so that all sorts of water scarcity problems are solved. In fact, today when there is water problem everywhere, it is always wise to be self-sufficient and have a water tank separately in the house or apartment, office, retail outlets, food joints, etc. You can always get variety of options to choose from at eConstruction Mart and based on a certain budget, it can be purchased and installed easily. You can check out the Sintex water tank price from our site, which is quite affordable. Sintex is a popular brand and you can definitely expect quality products and its best. Hence, it is indeed advisable to take this smart step towards a better living.